When you’re doing education sessions, it’s handy to have the links/resources in one place. It makes info much easier to share. 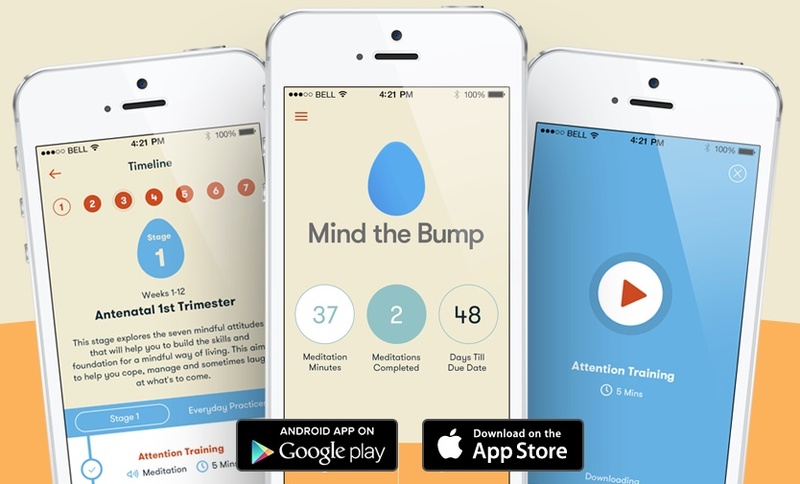 This is a terrific video to use/share with parents-to-be or new parents. The current “go to” model of attachment theory and affective neuroscience. 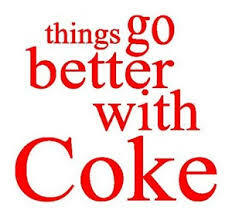 You’re also very welcome to share this page, the resources above and/or leave a comment below. This entry was posted in Blog and tagged emotional intelligence, Infant Mental Health, mental health, nurse, nurses, nursing, Perinatal Mental Health, postnatal, postpartum, puerperal, workshop on 12 July 2018 by Paul McNamara. 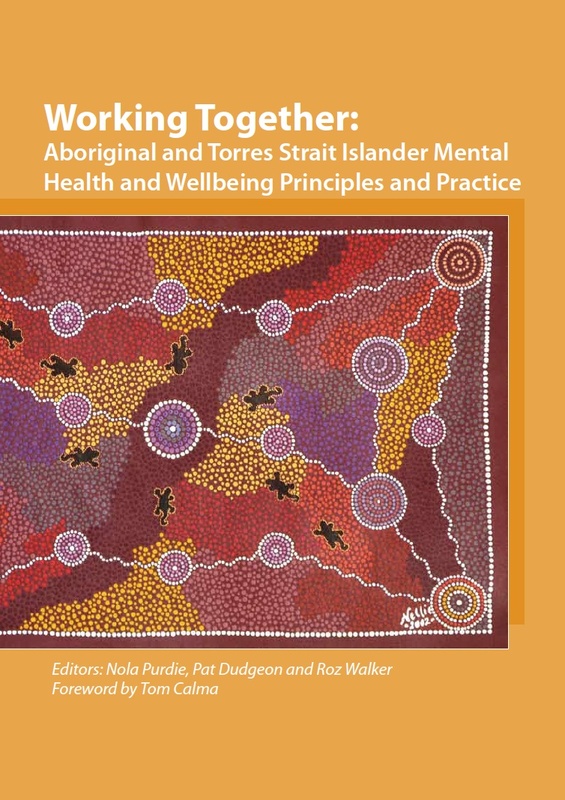 Mental health nurses have the skills to collaborate with primary health providers, work side-by-side with tertiary health providers, and provide support and information to those who experience mental health difficulties and their families. But how do we communicate this? 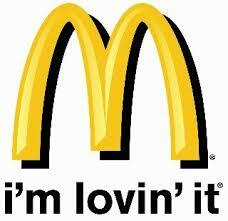 How do we make it easy for referrers and consumers to find the ‘best fit’ for identified needs? How do we promote collaborative care? How do we reach our audience? This poster presentation is the third iteration of a referral pathway that has undergone the usual quality improvement measures of consultation and review. The poster is also a showcase for collaboration: the content was gathered in collaboration with service providers and consumers; this information was then organised, revised and presented in collaboration with a graphic designer; the completed pathway was then deployed, reviewed and made accessible in collaboration with a web designer. This perinatal mental health referral pathway does not purport to be a template for others, but may serve as one example of how to develop, design and deploy accessible information about local service options. The poster presentation hopes to serve as a starting point for those who are interested in articulating a service’s relationship to the consumer and other agencies. The poster also demonstrates a clinically relevant use for Quick Response (QR) Code – please bring your smart phone if you intend to view the perinatal mental health referral pathway. NB: This 2011 Version is redundant. NOT for clinical use. Please use only as an example. 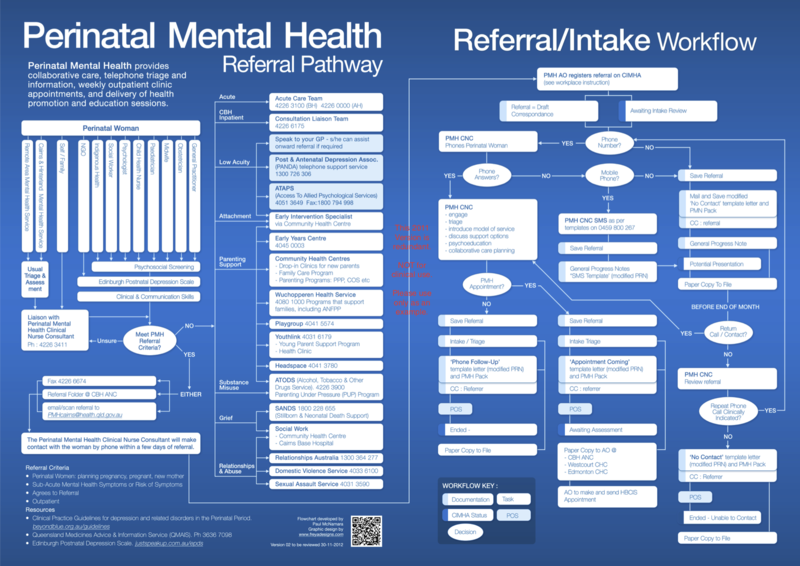 This flowchart first began to be mapped-out in 2010, the version above was finalised in November 2011, and presented at a mental health nursing conference in October 2012. The workflow and the position that developed/supported it became redundant in 2013. My versions were smudged pencil on paper versions. Freya Horn, now working as Graphic Artist at www.designerinyourpocket.com.au, turned it into the legible and attractive flowchart you see above. Thanks Freya! Just to reiterate: This 2011 Version is redundant. It is NOT for clinical use. Please use only as an example for how you/your local service may want to might develop a map of the local referral pathway and workflow. That’s it. Hopefully this will be of interest/use to someone in future. As always, your feedback is welcome via the comments section below. This entry was posted in Blog and tagged communication, innovation, mental health, nurse, nurses, nursing, Perinatal Mental Health, postnatal, postpartum, puerperal on 14 June 2018 by Paul McNamara. Previously for Perinatal Mental Health Workshops I have trickled-out the links and resources we refer to during the workshop via Twitter and Facebook. It’s a nice idea, and has worked pretty well (for more information about this experiment in social media enhanced education please see the video below and/or this link: meta4RN.com/workshop). 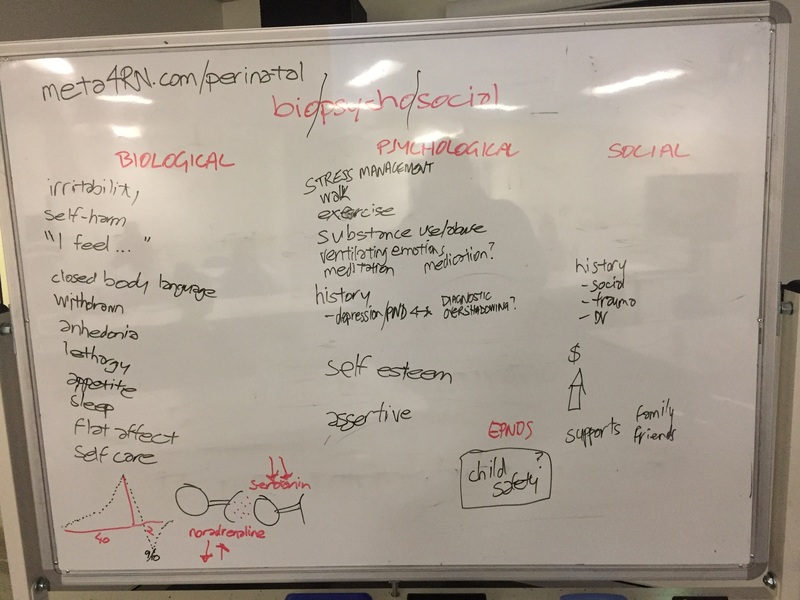 However, it is pretty labour-intensive to pre-schedule each individual Tweet and Facebook post every time I facilitate a Perinatal Mental Health Workshop, so to save some mucking-around I’ll list the links and resources here. That’s all I have on my list for now. Please add your suggestions for valuable links and resources to share at my Perinatal mental Health Workshops in the comments section below. This entry was posted in Blog and tagged anxiety, depression, mental health, Perinatal Mental Health, postnatal, postpartum, puerperal, workshop on 7 February 2014 by Paul McNamara. Back in June 2011 I was employed as a perinatal mental health nurse, and was working in partnership with midwives, child health nurses, GPs, Indigenous health workers, allied health staff and obstetricians to provide and develop easy, smooth pathways to mental health care for pregnant women and new mums who needed a bit of extra support. At the time I was invited to submit this article to O&G Magazine regarding perinatal mental health. It would be fair to say that availability of specialist perinatal mental health service in Australia has been patchy. In some health districts, perinatal mental health services have evolved without specific funding, often emerging as a component of consultation liaison mental health. However, until recently there hasn’t been a coordinated approach to perinatal mental health at a national level. This should be addressed, in part at least, by Federal, State and Territory Governments using National Perinatal Depression Initiative funding to seed specific services and models of service delivery at various urban and regional centres. In Queensland, for example, there will a dozen or so ‘perinatal mental health clinical nurse consultants’ seeded in a number of strategic locations around the state, with the hope/intent of developing sustainable referral pathways and contributing to workforce training and development in this area. Boy, did I get that wrong. There were a dozen or so perinatal mental health clinical nurse consultants in Queensland Health up until June 2013. Now there are three: two on the northern side of Brisbane and one in Toowoomba. Apparently (if the grapevine is correct) there are funded perinatal mental health positions in Townsville and Gold Coast too, it’s just that they’re both empty at the moment. That leaves two out of sixteen Queensland Hospital and Health Services currently with access to a perinatal mental health nurse. This is just as I feared back in March 2013 (see: The National Perinatal Depression Initiative and a Canary in a Coal Mine?). For the many health districts that have lost the specialist perinatal mental health nurse, the only alternative is to ask the woman to use phone support or see their GP instead. But there are problems with both the phone support and the GP option. Look, I have nothing but admiration for GPs – they’re at the frontline of primary health care and tend to be a very versatile bunch. But, let’s face it: most GPs are as busy as a one-armed Sydney taxi-driver with an ice-cream and an itch. It’s a big ask for the GP and the pregnant woman/new mum to make the time and head space available for ventilating, understanding and re-packaging strong emotions. When I’m meeting with somebody who is experiencing symptoms of depression, anxiety or other mental health difficulties, it usually takes me an hour or so to feel that I have provided an outlet for the distress, and gained an understanding of what strategies and services we should use to support the person. Maybe I have just have slow ears. Maybe GPs can hear, understand and sensitively respond to those complex stories of loss, grief, trauma and unmet expectations quicker than I can. Or maybe, just maybe, the families that have lost easy access to a specialist perinatal mental health nurse have lost easy access to support. In a cruel double-whammy, at the same time perinatal mental health nurse positions in Queensland were disappearing, the national perinatal mental health telephone support line was also becoming less accessible. 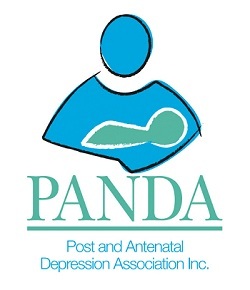 Since midway through 2013 PANDA’s National Perinatal Depression Helpline has had to cut-back on available hours to 10:00am to 5:00pm Monday to Friday. This time last year it was 9:00am to 9:00pm Monday to Friday. Earlier this year the Million Mums in May campaign was hoping to get funding for PANDA to offer a 24 hour, 7 day-per-week service. When perinatal mental health services on the ground are being cut in various places around the country, wouldn’t that be a good time to expand and promote the accessibility of the national helpline? Unfortunately, the opposite has occurred. It is not all doom and gloom: if parents live within cooee of a St John of God Raphael Centre or near of the long-established state-run perinatal mental health services (usually in capital cities), access to support is still pretty good. However, coverage is patchy: Australia’s “National” Perinatal Depression Initiative is anything but national. The “national” part is a myth. Access to specialist perinatal mental health services in Australia is a postcode lottery and, as with all lotteries, there are a lot of losing tickets. As always, your feedback and comments are welcome below. As there have been no formal announcements/media releases about perinatal mental health services contracting, I have had to rely on first-hand knowledge and, to a lesser extent, hearsay via “the grapevine”. If there any factual errors as at November 2013 please let me know. Naturally, i would like to make any necessary correction(s) as soon as practical. This entry was posted in Blog and tagged anxiety, depression, nursing, Perinatal Mental Health, postnatal, postpartum, puerperal on 28 November 2013 by Paul McNamara. Ever noticed how in the USA the term “postpartum depression” is used more often than here in Australia, where we mostly use the term “postnatal depression”? In the UK, from my online vantage-point anyway, it seems more mixed – as if the two terms are interchangeable. What’s the difference? Is it like, “You say potato, I say potato. You say tomato, I say tomato.”? What about “perinatal mental health” – what’s that all about? What’s the difference between “prenatal”, “antenatal” and “antinatal”? What’s “puerperal” – something to do with caterpillars? Words do matter. Many years ago I made the mistake of asking if the lady I was following-up had delivered. I was very firmly advised by my colleague, a Midwife, that, “Babies are born. Women give birth. Pizzas are delivered.” I was suitably chastened and, although not a midwife myself, I have tried to stay on top of most of the language midwives use. 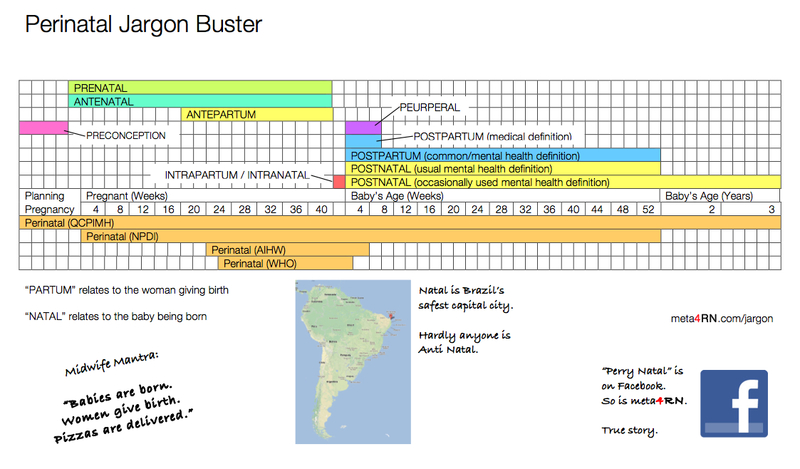 So, with that spirit of adventure, let’s see if we can get our heads around some key words in today’s perinatal jargon-busting post. “Perinatal” = around the time of birth, that is: both before and after the baby is born. Austin M-P, Highet N and the Guidelines Expert Advisory Committee (2011) Clinical practice guidelines for depression and related disorders – anxiety, bipolar disorder and puerperal psychosis – in the perinatal period. A guideline for primary care health professionals. 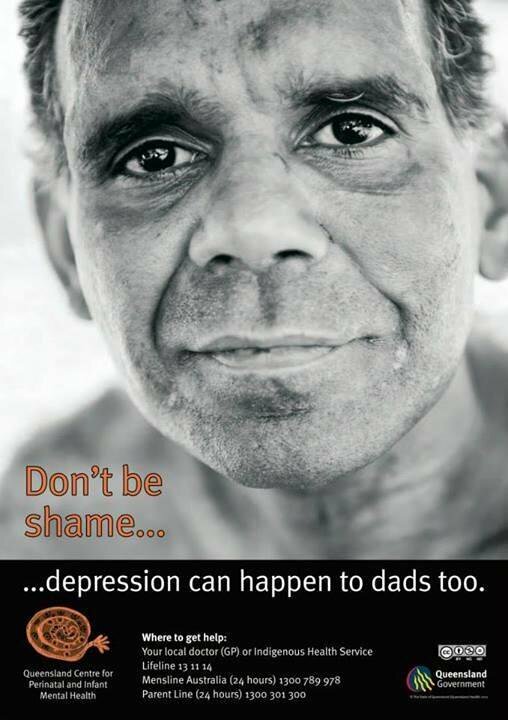 Melbourne: beyondblue: the national depression initiative. How long before and after is where it gets a bit tricky. The World Health Organisation define the perinatal period as from 22 completed weeks of pregnancy to 7 days after birth. The Australian Institute of Health and Welfare differ: they say the perinatal period starts after 20 completed weeks of gestation and ends 28 completed days after birth. The Australian Perinatal Mental Health Clinical Practice Guidelines, issued as part Australia’s National Perinatal Depression Initiative (NPDI), define the perinatal period as pregnancy and the first year after birth. Other organisations, such as the Queensland Centre for Perinatal and Infant Mental Health, define the perinatal period as including preconception, pregnancy, and up to three years after birth. Generally (not always) in the mental health clinical context, we think of the perinatal period as being over three phases: 1. planning pregnancy; 2. pregnant; 3. new parent. Just choose your definition of when the perinatal period should begin and end – from what we’ve seen above that’s what everyone else is doing. 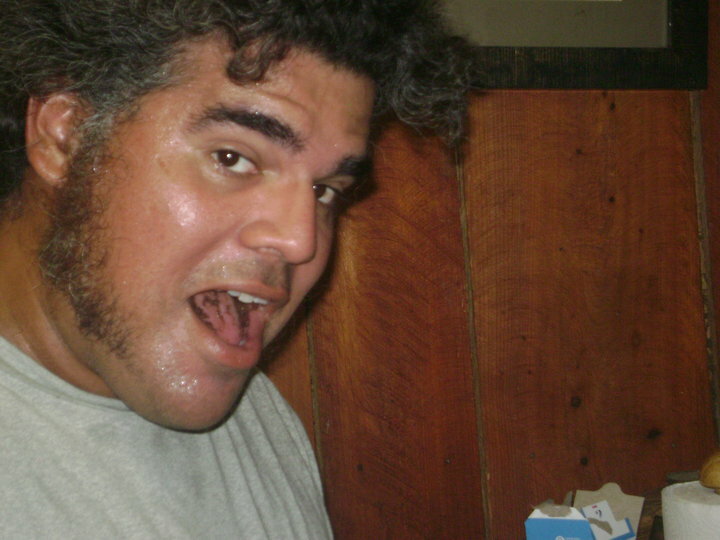 “Perry Natal” is on facebook – judging by his profile pic, he seems like a pretty fun guy. As far as I can tell he has no relationship to the perinatal period. “Prenatal” refers to pregnancy. I don’t think it gets used all that much in Australia – not that I’ve noticed, anyway. Semantically, it makes sense to use prenatal, but the usual convention seems to be to use the word “antenatal”. “Antenatal” gets used all the time to refer to pregnancy. “Ante” = before, so antenatal = before the infant is born. 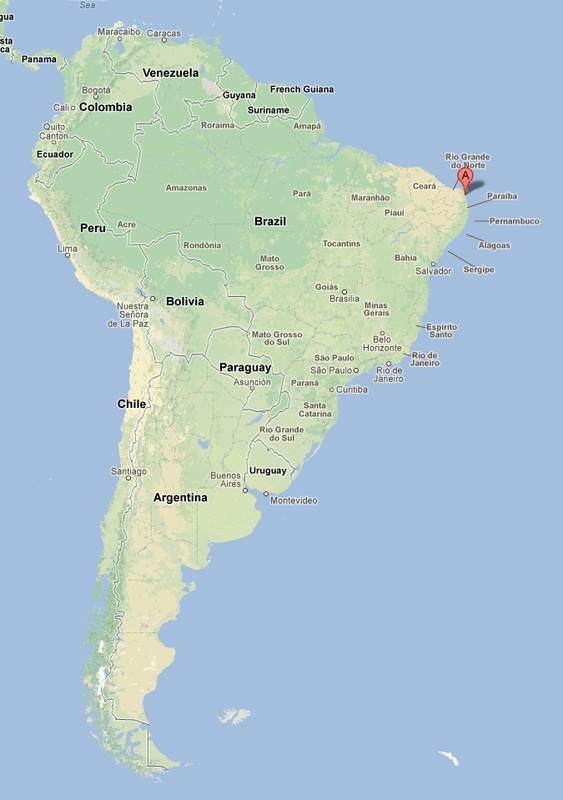 “Anti Natal” is either a spelling mistake, or an indication that somebody really hates Natal – the capital and largest city of Rio Grande do Norte, a northeastern state in Brazil. It is hard to imagine anyone hating Natal – it looks very pleasant, is considered the safest capital city in Brazil, and is home to the largest cashew tree in the world! Everyone loves cashews, don’t they? “Antepartum” is not a word I’ve heard used alone as replacement for “antenatal”, although I guess it could be. The word pops-up as a descriptor for a medical emergency that sometimes occurs after 20 weeks gestation: “antepartum haemorrhage” (aka APH). It’s probably used in other contexts too – please feel free to add anything important I’ve overlooked in the comments section below. Labour and childbirth may attract the descriptors “Intranatal” if it relates to the baby, and ‘intrapartum” as it relates to the woman. “Postnatal” is after the infant has been born. Literally speaking, everyone can participate in the postnatal period – baby, mum, dad, and whoever is there after the baby is born. Semantically this is why dads can experience postnatal depression. As with the definition of perinatal, definitions of how long the postnatal period lasts vary a lot. Generally when we’re thinking about postnatal depression we think mostly about the first six or twelve months, but it wouldn’t be unusual to think of any depression that arrives before baby’s third birthday as postnatal depression. “Postpartum” is after the woman has given birth. If we get bogged-down in the semantics, I’m pretty sure only a woman who has given birth can experience postpartum depression. Why? Because only the woman is postpartum, the baby and man are postnatal. 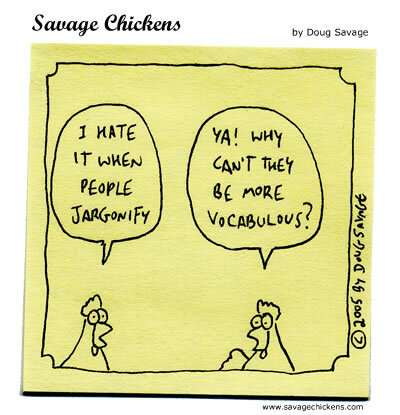 That said, it’s also pretty safe to say that hardly anyone gets bogged-down in the semantics. In common usage “postpartum depression” is applied to both women and men, and as with “postnatal depression’ there are varied definitions of how long the postpartum period lasts when it is related to depression. I think obstetricians and midwives have a much more defined, discrete definition on how long the postpartum period is, and sometimes refer to it as the “fourth stage of labor”. “Puerperal” or “the puerperium” relates to the time from immediately after birth of the placenta to six weeks, with an emphasis on the first two weeks. Something like 80%-90% of first-time mums will experience the baby blues in the puerperium. It’s a transient, self-resolving emotional lability that arrives within a few days of childbirth and goes away within hours or (if you’re a bit unlucky) a few days. More info here. Which brings me back to where the idea for this post started. Broadly, when people use any of the terms “postnatal psychosis”, “postpartum psychosis” and “puerperal psychosis”, they’re usually talking about the same thing. I would make the distinction that puerperal psychosis is specific to onset of symptoms in the first fortnight or so after birth. Similarly, “postnatal depression” and “postpartum depression” are used pretty-much as interchangeable terms, even though there are semantic differences… same with the abbreviations PND and PPD. If the illustrated summary is of any use, there is an easier-to-print PDF version here. As always, your thoughts/comments/corrections are welcome in the section below. This entry was posted in Blog and tagged geeky stuff, jargon, nursing, Perinatal Mental Health, postnatal, postpartum, puerperal on 23 April 2013 by Paul McNamara.